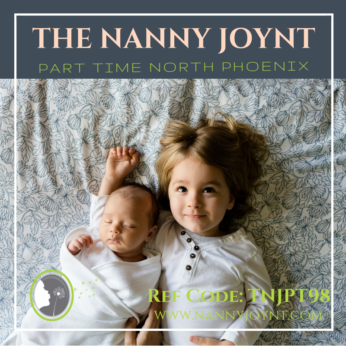 The Nanny Joynt is excited to share a great position working with a family who is relocating to Phoenix in December. This family has two children. Their daughter is 3 years old, she loves dance, ballet and singing. She enjoys reading, playing soccer and riding her bike. Mom says she can be shy at first, but once she warms up to someone she is very engaging and interactive. Their son is only 2 months old and so sweet. He is a good sleeper and working on tummy time each day. He enjoys being read to and also enjoys when people sing to him. This family is seeking a nanny who bilingual in English and another language, preferably Spanish, but they are also open to other languages as they hope for their children to learn a second language. This position is offering $20 per hour. The schedule will be 27 hours a week with guaranteed hours, paid vacation, paid holidays and paid sick time, there is potential for more hours in the future. Both Mom and Dad work from home during the day, but are in and out on a regular basis. A nanny who is comfortable working with parents in the home is a must. Both parents fully respect the role of the nanny and allows her to be in charge while she is there. Their oldest daughter will most likely be attending preschool for half days in the fall of 2019, so some driving of the children may be required at that point. The ideal nanny for this position will be bilingual, calm, assertive, gentle and flexible. This family eats healthy and would like for their nanny to provide healthy choices for the children. They do have a pool so the nanny must be completely comfortable in the water with the children or able to save them if needed. Maintaining a daily log, activities, sleep, etc for the baby. Light house cleaning. They do employ a housecleaner for deep cleaning. Making beds, having the children help out. The family plans to get a puppy once they get settled in so a nanny who enjoys being around dogs would be great. Some pet care may be needed, feeding, watering, letting in and out during the day. They are seeking a long term commitment and hope to find a nanny who will become an active part of their family for years to come! They are very supportive of their nanny and want her to feel comfortable in their home. They enjoy direct communication and would enjoy receiving texts and photos throughout the day. This is a fun family who has a relaxed home and great environment! They really strive to keep the focus on communication and education and would love their nanny to do a lot of reading and developmental activities with the children during the day. Getting the children outside each day and keeping them away from screen time is also very important to this family.